Roasted beet salad with goat cheese topped with a sweet and tangy pomegranate dressing. Walnuts add a nice crunch to each healthy bite! This post is sponsored by Nature’s Intent Organic Apple Cider Vinegar. All opinions are my own. 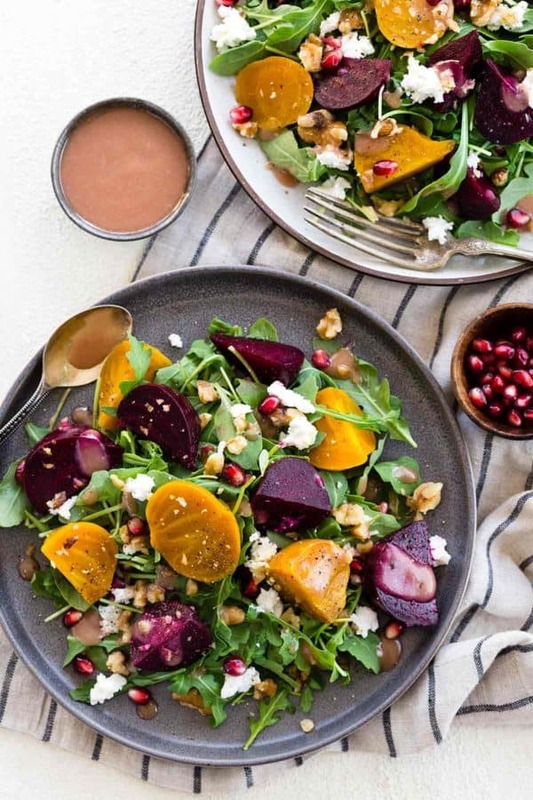 A great way to combine flavorful seasonal ingredients while taking advantage of their nutritional benefits is making a fresh dish like this colorful beet salad. A simple roasting technique transforms hard root vegetables into tender, sweet and earthy flavored stars of the recipe. Adding them to your meal provides a good source of fiber, plus potassium, manganese, magnesium, folate, iron, and vitamin C.
Fresh arugula lettuce has a slight peppery flavor, which complements the mild taste of the beets and the creamy goat cheese. An easy to make pomegranate dressing gets generously drizzled over this salad, adding vibrant flavors and polyphenol antioxidants from the fruit to each forkful. Beets are a unique vegetable because nearly the entire plant from the bulb, to the stem, and the hearty greens are edible with each providing a different nutrient profile and taste. There are many different colors of beets that can buy at the market. 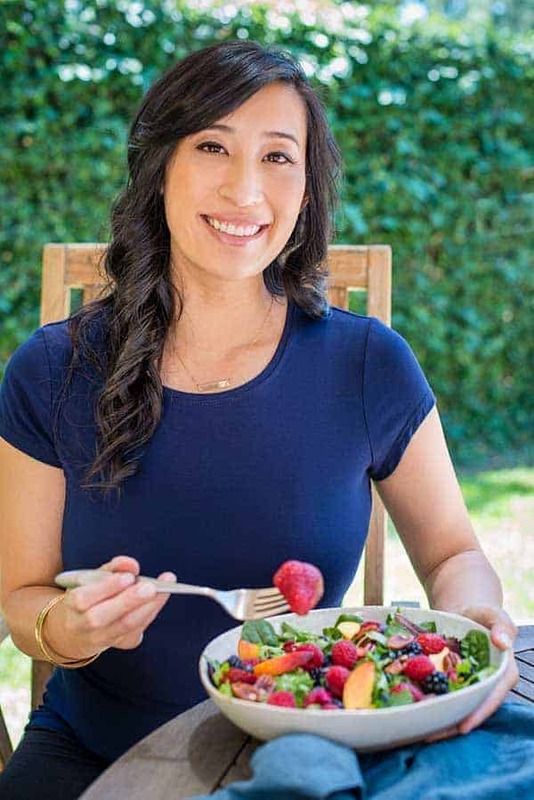 I selected dark red and golden beets for this salad to give an attractive pop of color. Try to find beets of similar size, about 2-to-3 inches in diameter so that they cook evenly and in a shorter amount of time. There are many ways to prepare and cook beets. They can be eaten raw, steamed, baked, boiled or roasted. For this recipe, I roasted them similar to my beet hummus recipe because the high heat enhances the natural sweetness. This cooking method makes it easy to prepare and probably the least messy. Preparation involves cutting off the long stems and tossing the bulbs with oil, salt, pepper and tightly enclosing them in foil packets. 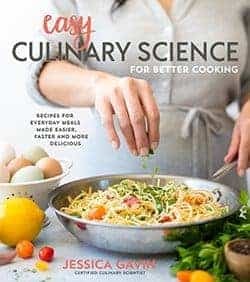 This effortlessly cooks the flesh in under an hour. It’s easy to remove the thick outer skin after roasting by using your fingers to peel off the outside layer. They are now ready to be cut and added to the salad. Pomegranates are ripe and abundant at the market, especially during the Fall season. I like to take full advantage of this superfruit using the juice and arils in my smoothie and breakfast recipes. Not to mention it’s super fun removing the seeds! The juice has an intensely sweet, mouth puckering and cranberry-like taste. It makes the perfect base for a dressing. This dressing is made in under a minute in a blender, creating a smooth and thickened texture. It’s just six wholesome ingredients; pomegranate juice, shallots, dijon mustard, maple syrup, olive oil, and apple cider vinegar. 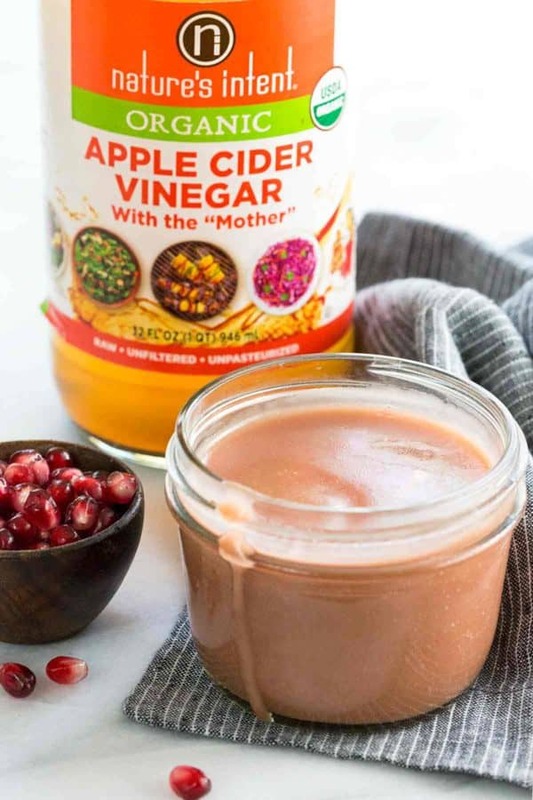 The apple cider vinegar has a natural acidity that instantly boosts the fruit flavors in the dressing to yield a lovely vinaigrette. Right before serving, I add soft goat cheese crumbles, although sometimes I’m in the mood for a slightly fried goat cheese. The texture of the cheese compliments the crunchy walnuts, and whole pomegranate seeds that are sprinkled on top. This gorgeous beet salad will shine on your dinner table or at any special gathering! Don’t throw away those beet stems and leaves! Those edible parts can be washed, cut and eaten. Saute the stems and green tops in a little bit of oil and seasoning for a tasty vegetable side dish that tastes similar to kale. You can also cut the greens into smaller shreds and add them right to the salad. However, they do have a slightly bitter taste which can be offset with the sweetness of the beet bulbs and dressing. By saving and eating the greens, you’ll receive a rich fiber source and various vitamins and minerals! 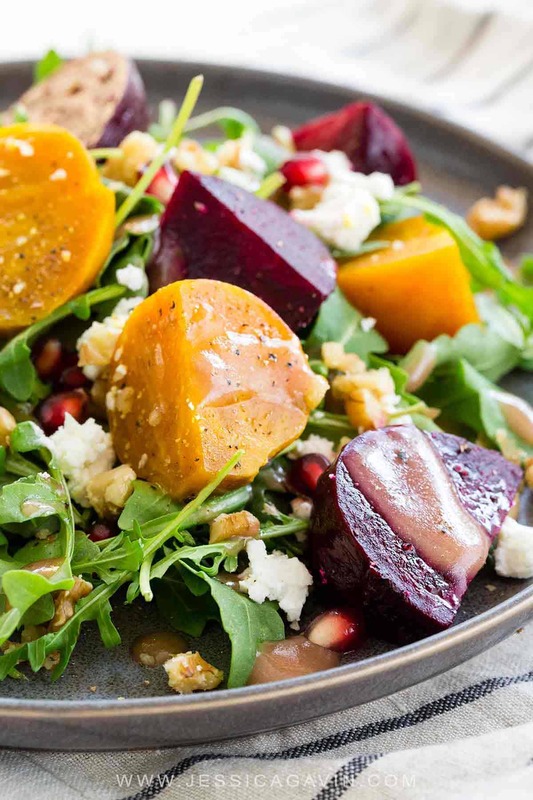 Healthy roasted beet salad with goat cheese is an easy to prepare dish! Fresh arugula and tender beets are drizzled with a sweet and tangy pomegranate dressing. Set the oven rack in the center position. Preheat oven to 400°F. Trim the tops off the beets, leaving 1/2 inch of the stem. Wash and scrub dirt from the beets and dry well. Place beets on a piece of foil large enough to make a pouch. Drizzle with enough olive oil to coat the beets, then sprinkle with salt and pepper. Wrap the beets tightly in the foil and place on a sheet tray. Roast the beets until fork tender, about 40 to 60 minutes, time will vary depending on the size of the beets. Check every 20 minutes for doneness. Allow beets to cool, peel and cut into 1/2-inch wedges. Set aside. Add pomegranate juice, apple cider vinegar, shallots and maple syrup to a blender. Blend on medium speed until smooth, about 15 seconds. Slowly add in 3/4 cups of olive oil to the running blender until the dressing has thickened and is emulsified. Season with 1/8 teaspoon salt and pepper to taste. To serve top the arugula with sliced beets, goat cheese, pomegranate arils and chopped walnuts. Serve with pomegranate dressing. Great flavors! I turned this into a salad wrap and it worked really well I thought. I’m sure it would be great on it’s own too! Thanks for sharing! Thank you Sam! I love the idea of turning it into a wrap, I will have to try it! Please, what are the orange things? Thank you. Your nutrition panel states 1 serving equals 45 g of fat. Can this be true?? Where is all the fat coming from? It looked so healthy to me. …. The recipe includes all of the dressing, cheese, and nuts. If you used it all, it may hit that level of fat. You could cut back on the nuts and cheese. I hope that makes sense! I want to make this but I don’t like maple syrup. Will the salad still be good if I leave the syrup out of it? Hi Carol- The maple syrup balances the flavors of the salad dressing. You could also use honey, agave, or sugar if you don’t have maple syrup. Didn’t have the Pom ingredients used unsweetened cranberry juice in the dressing and dried cranberries and toasted walnuts plus the goat cheese to garnish. Great subs. Thank you for the tasty substitutions, Diane!